Description: My inspiration for 'Canary Through A Fan' came from my passion to explore the concepts of color theory and movement in regards to abstract painting. 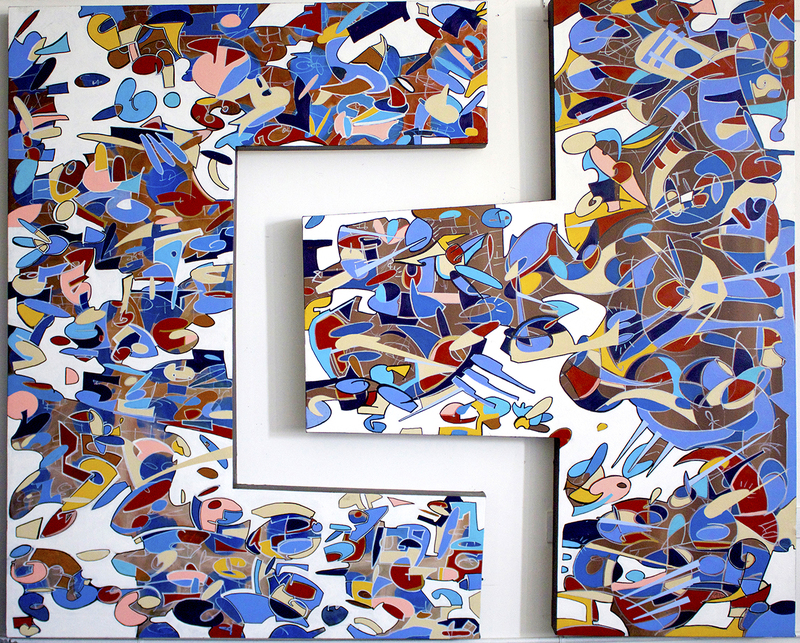 I chose to create a diptych style painting that which was built like puzzle pieces so that they would interlock. I wanted to make a painting shape that had never been made before so that the foundation of the piece would strike mystery into the eyes that viewed it. I concentrated on the spacing of the shapes while painting, the movement of these shapes, and the opacity of the composition. My goal was to create a piece of art that was bright and fun, yet also complicated and calculated. Like life, this piece was cloaked in irony. I wanted the whimsical chaos of design to swim throughout the piece, sharing a free associative feeling with the viewer, however there was much time spent on making sure that the chaos did not overwhelm. I needed there to be an airiness about the art so that one would'nt feel suffocated by the tremendous amount of color it revealed. There needed to be a balance between the chaos and the calmness. Abstract painting for me is less about the message or theme at times and is more about the math and flow. I enjoy the challenge of making a complicated situation look easy when in reference to the aesthetic. My aim with this specific piece was to make it dance without showing the noise the chaos was dancing to. Making visual Algebra playout like elementary mathematics was both what made the piece difficult and fun.